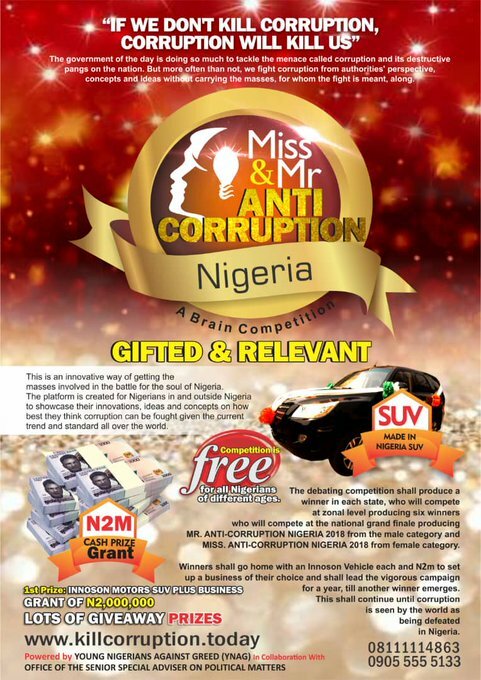 Win SUV and N2Million in Miss & Mr Anti Corruption Nigeria. Do you have an idea or know anyone that has an idea to how we can fight corruption in Nigeria ? Let's join hands to bring corruption to its knee in Nigeria. If you have an idea on how we can tackle corruption in the nation, this brain competition at killcorruption.today is just for you. Win a brand new SUV and N2m business grant. This debate is an innovative way of getting the masses involved in the battle for the soul of Nigeria. The platform is created for Nigerians in Nigeria to showcase their innovations, ideas and concepts on how best they think corruption can be fought given the current trend and standard all over the world. 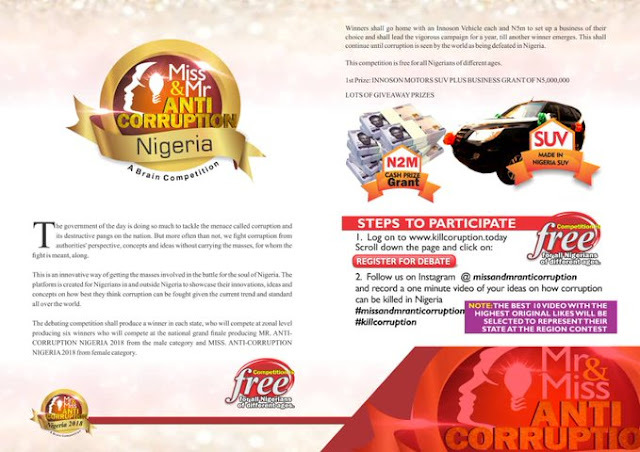 Miss & Mr. Ant-Corruption is an innovative way of getting the public involved in the battle against corruption in Nigeria. The brain pageant will pick ten contestants from each of the 36 states of the federation who will compete at the zonal level from where six winners will emerge representing each of the six geopolitical zones who will eventually slug it out at the finals. The best 10 videos with the highest original likes and points from fans and judges will be selected to represent their states. 2nd : Grant of N2Million Naira.